(May 1, 2002) -- With American Airlines on a potential collision course with LB's Airport ordinance, having filed an administrative appeal that could escalate LB's noise budgeted 41 daily flight limit on large aircraft to the City Council (or ultimately a federal court), American Airlines' Managing Director of Corporate Affairs Dan Hagan arrived in LB today. Details of Mr. Hagan's visit are sketchy as we post, but sources tell LBReport.com that Hagan may try to schedule meetings with at least some LB elected and staff officials during his visit. 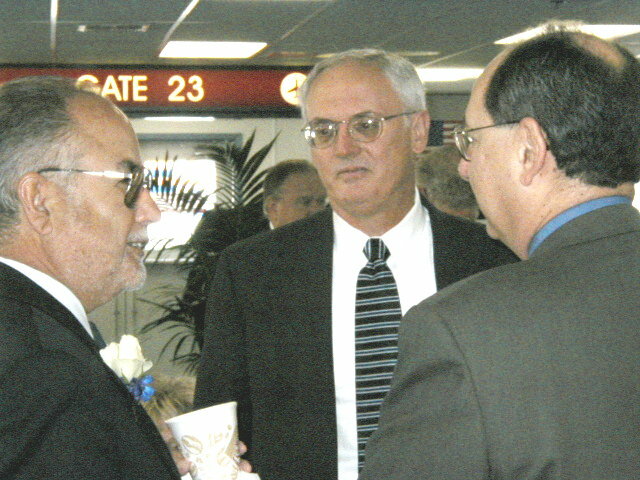 LBReport.com spotted Mr. Hagan (center of photo right) at a LB Airport media event accompanied by LB public relations maven Jeff Adler (right in photo; City Manager Henry Taboada at left). Mr. Adler is regarded as one of the city's most able P.R. and political hands. His communications firm handles clients including DDR (Pike at Rainbow Harbor developer) and has run or consulted a number of LB political campaigns. The arrival of AA corporate brass added a surreal tone to two Airport media events, inescapably framed by the possible gathering legal storm. Hagan and other AA officials were present at a 10:30 a.m. LB Airport media event today attended by LB officials and business interests. The event used an arriving American Airlines flight as a backdrop to promote LB Airport's new boarding lounge and new car rental center. A local AA rep spoke, as did Mayor Beverly O'Neill and City Manager Henry Taboada. The event also included America West reps.
An hour earlier, LB officials and media gathered for an Airport promotional event applauding JetBlue's addition of two daily arrivals and two daily departures serving Washington Dulles airport (JetBlue is also starting twice daily from Oakland to DC). 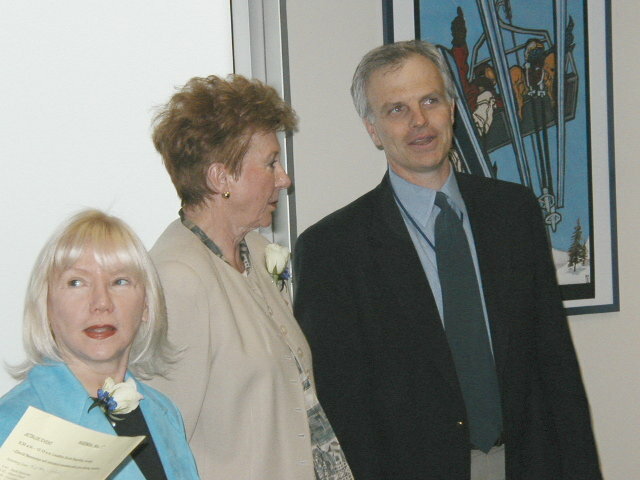 JetBlue's CEO David Neeleman attended and spoke, as did the Mayor and 5th district Councilwoman Jackie Kell (all three pictured in photo, right). JetBlue has added two new incoming flights at 9:05 a.m. and 8:05 p.m., with two new departing flights at 10:00 a.m. and 9:45 p.m. The JetBlue event was MC'd by JetBlue Opportunities Manager Kristy Ardizzone, who continues to chair LB's Airport Advisory Commission. Roughly an hour later, LB officialdom and representatives of American Airlines and America West gathered in the new north terminal building. Carl Perillo [sp], American Airlines Area Manager: ...American's schedule, based upon the size of the facility will allow us to operate our 757's to New York starting June 15 and American will also be inaugurating Chicago service again out Long Beach on the 15th of June. We'd like to thank the city for our long relationship in working with you folks and we really enjoy being here and we'd like to thank you very much. City officials appeared upbeat at the two events despite a high stakes dispute between American Airlines and the City of Long Beach. In May, 2001, with 27 flight slots vacant, the City Council amended LB's flight slot ordinance to let carriers hold slots longer before flying them. JetBlue then took all 27 remaining vacant flight slots. maxing out the current 41. AA blames City Hall for causing the current unavailability of permanent flight slots and says LB's unwillingness to provide additional permanent slots while only 17 of the 41 are currently being flown is unfair and harms AA's ability to compete. AA has agreed to use temporary (and thus revocable) slots to begin additional LB Airport flights while using City Hall's administrative appeal process to challenge LB Airport's denial. That process could eventually escalate the city's noise budgeted flight limit to the City Council or a federal court. While insisting it hopes to avoid litigation, AA has repeatedly reserved its right to challenge LB's position in court. American Airlines has told LBReport.com that on April 29, it presented a background paper to the City of Long Beach. AA and LB Airport both subsequently made the text available to LBReport.com on request. 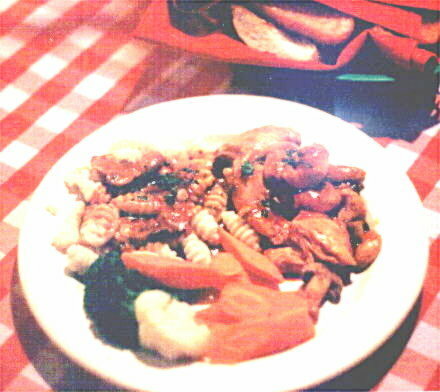 We post it verbatim on a link below. (A separate window will open; to return to this page, close the AA background paper text window). AA's background paper is understandably an advocacy document promoting the company's interests. LB's interests, as viewed by the City of LB, and by LB homeowner and taxpayer groups, deserve similar presentation. When they are forthcoming, we intend to post them as newsworthy. And we will, of course, offer our editorial opinions. To view AA's position paper, click AA background paper. Meanwhile, LBReport.com has learned that Alaska Airlines, which last month formally requested three flight slots at LB Airport, has now also begun the administrative appeal process that could lead to the City Council. 5th district Councilwoman Jackie Kell and staff aide Tim Patton attended today's Airport promotional events, but were the only Council representatives we spotted. Also seen were Randy Gordon (LB Area Chamber of Commerce), Greg Whelan (Strategic Marketing, Inc.), Connie Sziebl (aide to Cong. Steve Horn), LB Public Works Director Ed Shikada, LB Airport Manager Chris Kunze and LB Airport Advisory Commissioner Derek K. Brown.